The media had recently carried some erroneous version of the facts leading to the incident of alleged assault at the Jayawardenepura University, said the Jayawardenapura University Arts Faculty Bhikku Students’ Council. Ven. Kamburugamuwe Gnaneeswara Thera said that the Council had invited the media to inform the real facts that had taken place on the night of October 24. The Ven. Thera said that the Vice Chancellor had entered the bhikku students’ hostel on the night of October 24 along with the Disciplinary Director, a personal aide and about six security guards who were on duty. They had inquired whether four bhikkus suspended from attending lectures were present. When the bhikkus had replied in the negative, the Vice Chancellor and others had abused them in harsh language and even attempted to assault them, said Ven. Gnaneeswara Thera. 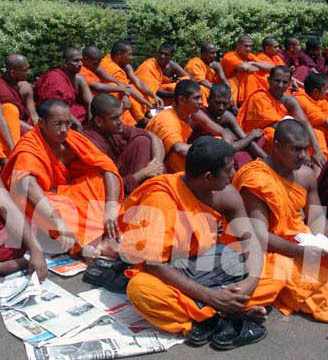 Two monk students who had intervened had been assaulted and they had lodged a complaint with the Mirihana Police the same night and are now away after being treated for their injuries at the National Hospital in Colombo, the bhikku council member said. “We performed a protest by holding a satyagraha near the entrance to the university yesterday (Oct. 25). The VC is spreading various false allegations against us,” reiterated the Buddhist monk. He charged that the VC had told various media different reasons for his visit to the hostel at night. One stated that he had visited the university to invite some monks for a Katina pinkama (alms giving) while another had stated he had dropped in while on a private trip. Yet another had stated that the VC came to inquire into complaints by residents in the vicinity that the bhikkus were behaving boisterously. If the VC was on a private journey, how come his personal aide and the Disciplinary Director were with him, asked the student monk. As for the complaints, there had only been one such complaint from a resident living in close proximity. This person was, together with the Vice Chancellor is attempting to destroy the university and Buddhism by carrying out a contract to some individuals, charged the students council member.